I have had a wonderful day but it is now late and my eyes just can't stay open any longer. So I thought I would share a snippet from my day and would like to see if anyone can guess what it is? I promise I will reveal all tomorrow. "Davine Time" update: Enjoying a beautiful sunny, relaxing, enjoyable day with the man in my life. 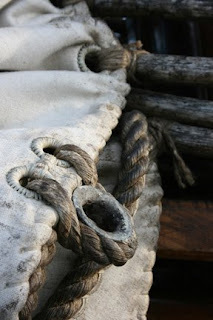 A tie down portion of a sail? I can't wait to find out. I love a good picture mystery. Not sure!!! Hope you have had a great day!! A part of a tent? I have no idea what it is but the first thing that came to my mind was Johnny Depp and Pirates of the Caribbean-- Random, but I thought of the ship. I'll be watching to see what it really is.